Orlando Soria is the West Coast Creative Director for Homepolish. Born and raised in the Golden State, he has focused his career on creating beautiful spaces. After graduating from the design schools of Cornell and The University of Pennsylvania, he landed a spot as an on-camera designer on HGTV. 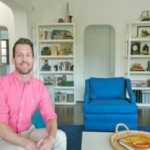 He then founded an interior design firm with Design Star Emily Henderson, later branching off to create his own company prior to joining Homepolish. The HelloGiggles Office Makeover: Revealed!